Our family loves to celebrate Easter and for me it’s all about new life. This Easter will be one that I won’t want to forget. It’s our youngest’s first Easter and so I’ve been busy getting everything ready for the occasion. I also can’t wait to see what my 2 year old son does at the Easter Egg Hunt. It’s going to be so fun! I love everything about Easter and so I’ve also been busy getting baskets and treats for everyone. 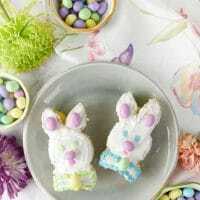 These Bunny Mini Cakes are so cute and simple to make. It’s based on the cake my mom always makes for Easter, but I used cupcakes to make it mini sized. This year I am also making a basket that has yummy treats, but also doubles as a centerpiece! So fun! 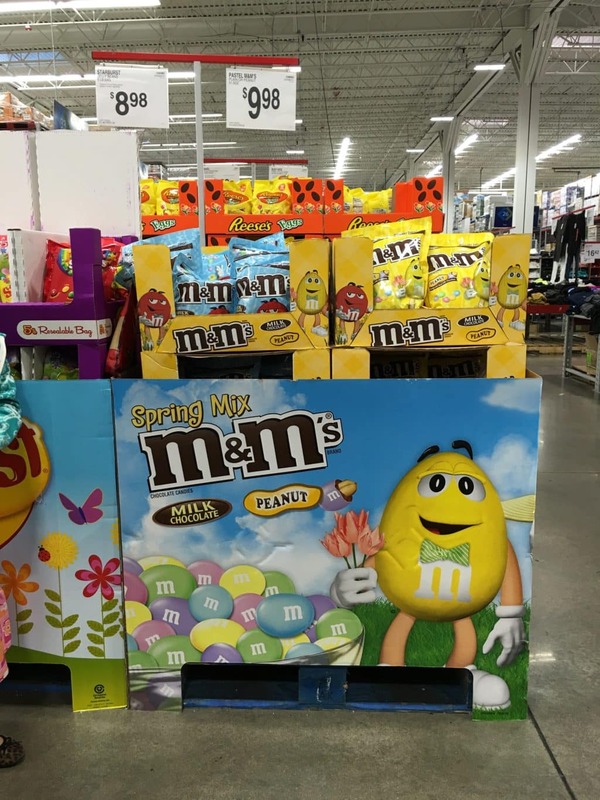 I found an awesome display at Sam’s that had M&M’s® Pastel Plain 56 oz., M&M’s® Pastel Peanut 56 oz. and MARS® Spring Minis Mix 52 oz. We ended up getting the M&M’s® Pastel Peanut 56 oz. and MARS® Spring Minis Mix 52 oz. to use for the Easter goodies and decor. I always love shopping at Sam’s and I know these large bags will go a long way for Easter. These Bunny Mini Cakes are so fun to make. Just cut out the shape, frost it and then decorate with M&M’s® Pastel Peanut 56 oz and Easter sprinkles. They turned out so cute! M &M's® Pastel Peanut 56 oz. Make cupcakes from the cake mix according to the box instructions. Let these completely cool before cutting and icing. For the icing combine the container of store bought icing, 1/2 cup Crisco and powdered sugar. Beat on high with a mixer until combined. Cut the cupcakes like a bunny (As seen in photo). Take 2 cupcakes and leave one whole. Cut a <g class="gr_ gr_550 gr-alert gr_spell undefined ContextualSpelling" id="550" data-gr-id="550">bowtie</g> down the middle which makes the ears at the same time. Assemble by placing the ears on top and the bow tie on <g class="gr_ gr_552 gr-alert gr_gramm undefined Grammar only-ins doubleReplace replaceWithoutSep" id="552" data-gr-id="552">bottom</g>. Ice and decorate to make it look like a bunny. 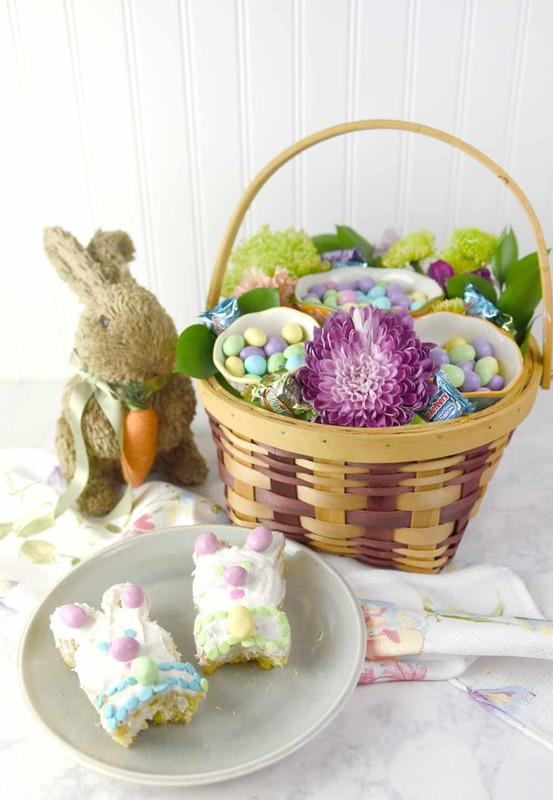 Easter baskets make beautiful centerpieces and this one combines a traditional candy basket with a floral arrangement. All you need to make this basket is the basket, tissue paper, florist foam, bowls, fresh cut flowers, MARS® Spring Minis Mix 52 oz. and M&M’s® Pastel Peanut 56 oz. First step is to fill the basket with the florist foam and tissue paper to the top of the basket. Then place the bowls with M&M’s® Pastel Peanut 56 oz inside the basket on top of the tissue paper. Next add the flowers around the bowls. I used flowers that I found at Sam’s Club. Next insert the different candies from the MARS® Spring Minis Mix into the arrangement. Now it’s complete! So easy and perfect for any Easter entertaining. 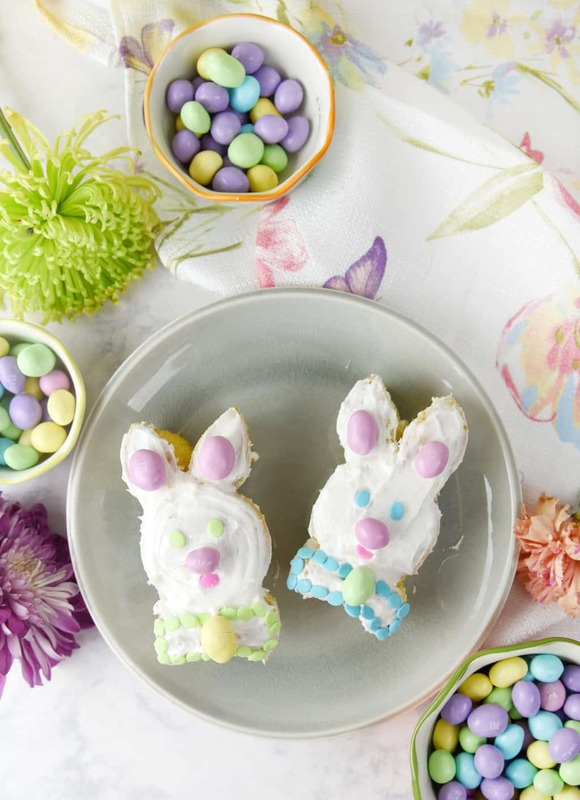 What are your favorite things to make for Easter? Thank you great simple idea to make.